Love him or hate him, one thing about John Latschar’s tenure as superintendent at Gettysburg National Military Park is certain — he will be remembered. “My legacy is up for other people to decide,” Latschar said Friday, the day he announced he was leaving his post after 14 years on the job. Latschar announced Friday that he’s resigning effective March 1, 2009, to take over as president of the Gettysburg Foundation, the park’s non-profit fundraising partner. Acting foundation President Robert C. Wilburn is resigning at the same time, and plans to pursue other career options. “One word describes Dr. Latschar when I think of his attributes: brilliant,” said Main Street Board of Directors Chairman Bill Kough. “His priorities are family, country, history and community.” The battlefield boss has developed a legion of critics over the years. “It’s not unexpected that he’s going over to the foundation,” said Steinwehr Avenue entrepreneur Eric Uberman. “He’s never going to leave.” Some long-time opponents of the Latschar regime are questioning the legalities of his career move. Borough Council Vice President Holliday Giles spoke highly of the man who she feels was instrumental in several downtown restoration projects, including the Gettysburg Railroad Station and David Wills House. 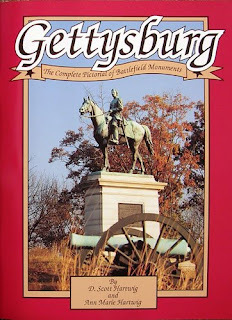 “Whatever project John Latschar takes on, especially with the Borough of Gettysburg, it is very apparent that he uses all of his expertise and knowledge for all to benefit,” Giles said Friday. Latschar may have been an intimidating figure over the years, but local leaders maintain that he’s generally been very approachable. “We were always able to sit down and come to a mutual understanding that was beneficial and positive to our township,” said Cumberland Township Board of Supervisors Chairman John P. Gregor. 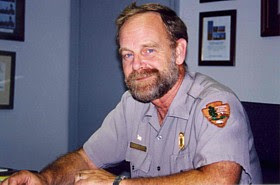 Latschar has been superintendent of the park since 1994, and is a 31-year veteran of the National Park Service. He previously served as the first Superintendent of Steamtown National Historic Site in Scranton, Pa., and in various capacities at the park’s Denver Service Center. Latschar was named Superintendent of the Year for the Northeast Region in 1991 and in 2001. News---What Would Lincoln Do? If Barack Obama is looking for a model . . .
WWLD? (What would Lincoln Do? ), Patrick T. Reardon, Chicago Tribune, November 9, 2008. If Barack Obama is looking for a model as president-elect, Abraham Lincoln seems perfect. In a time of national crisis, with Southern states seceding from the Union, that earlier son of Illinois had to prepare himself for taking office—but also avoid making a misstep. It was his first test as a national leader. So, what lessons can Obama learn from what Lincoln did—and didn't do—in the time between his election and inauguration? 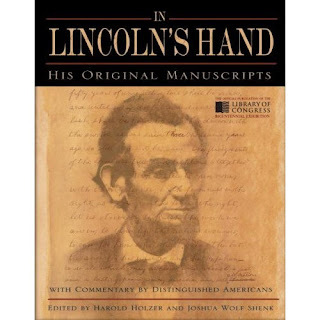 To find out, the Tribune asked two Lincoln scholars, Harold Holzer, author of the newly published "Lincoln President-elect: Abraham Lincoln and the Great Secession Winter 1860-1861," and James McPherson, author of the classic Civil War history tome "Battle Cry of Freedom" and "Tried by War: Abraham Lincoln as Commander in Chief," published in October. Lesson 1: Keep your cards close to your vest. Although pressured to deal with the secession, Lincoln refused to say anything to placate Southern leaders before his inauguration. "They tried to get him to approve compromise measures, but he wouldn't do it," said Holzer. "He said, 'By no act or complicity of mine shall the Republican party become a mere sucked egg, all shell and no principle in it.' 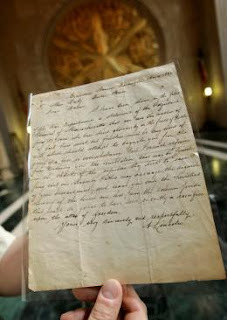 " McPherson said, "Lincoln was like Franklin Roosevelt in the Depression. He didn't want to commit himself ahead of time." 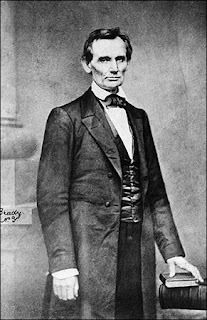 As president, Lincoln had power that gave him leverage in negotiations. But not as president-elect. Lesson 2: Avoid empty rhetoric. On his way to the inauguration, Lincoln took an 11-day train trip with whistle stops at dozens of cities and towns along the way. Lincoln didn't want to tip his hand about his plans for the South, so he gave speeches filled with bromides. "They were meaningless remarks, and they came across to many people as taking the crisis too lightly," McPherson said. Lesson 3: Court the opposition media. "One of the first things Lincoln did was invite a reporter for the pro-Stephen Douglas New York Herald to spend time with him," said Holzer. "He was virtually embedded in his office for four months. The reporter, who at first doubted him, was writing positively about him by the end. It would be like Obama inviting Sean Hannity to spend a lot of time with him." Lesson 4: Pick Cabinet members who have skills and knowledge you lack. "Some of the people Lincoln appointed had a good deal more experience in the federal government and in administration than he had," McPherson said. Lesson 5: Use your Cabinet to bring diversity into your administration. "In Lincoln's day, diversity meant regional and political roots," Holzer said. The Republican Party had been created by former Democrats and Whigs, so Lincoln "had as many former Democrats as former Whigs" in his Cabinet, Holzer said. Also, he had representatives from the various regions in the nation. "Today, it's ethnic and gender diversity that's needed." Lesson 6: Use your Cabinet appointments to unite your party behind you. "Lincoln appointed four of his [Republican] presidential rivals to the Cabinet—Salmon Chase, William Seward, Edward Bates and Simon Cameron," said McPherson. "I suppose Hillary Clinton would be the parallel." In fact, he said Obama already moved in this direction by naming former primary opponent Sen. Joe Biden as his running mate. Lesson 7: Get any resentment or bitterness off your chest in the first draft of your inaugural address—then cut it all out. "Lincoln really poured it on in his first draft, and ended it with a line that the choice was between peace or the sword. But, in later drafts, he kept toning it down," Holzer said. "The final draft ended with the line about the 'better angels of our nature.' "
Lesson 8: Use your inaugural address to set the tone for your presidency. Like many presidents before and since, Lincoln sent a message with his inaugural—that he would uphold the Union, even while trying to avoid civil war. "Lincoln used the inaugural to make clear that his administration would not accept the legitimacy of secession," McPherson said. "[Unless provoked,] the government would take no action against the South, and would follow a policy of encouraging Unionists. But he stood for the integrity of the nation, of the Union." Image Souce: Library of Congress, February 1860 at the time of the Cooper Union Speech. CWL: 1.) My daughter reports that Jon Stewart (Comedy Central) interviewed one of Obama's law professors. The professor said that two, tall, thin white guys from Illinois have been elected President: Abraham Lincoln and Barack Obama. 2.) It was nice to hear Lincoln quoted three times, I believe, in the victory speech in Grant Park, Chicago. Latschar Leaving Gettysburg Park For Foundation Post, Erin James, Evening Sun, November 7, 2008. 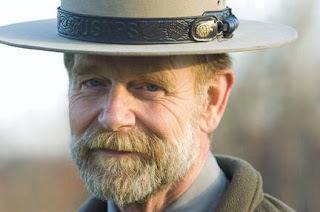 Gettysburg National Military Park Superintendent John Latschar will leave his post on March 1, 2009 to replace Robert Wilburn as president of the nonprofit Gettysburg Foundation. Latschar was named to the post by a unanimous vote of the foundation's board of directors, the park announced today. 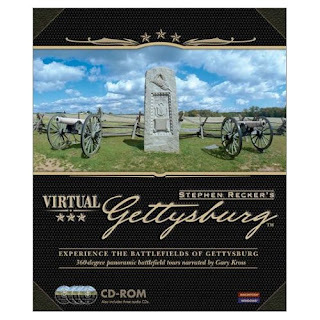 As president of the Gettysburg Foundation, Latschar will oversee operations of the newly opened Gettysburg National Military Park Museum and Visitor Center. The foundation is also in the midst of a $125 million Campaign to Preserve Gettysburg, aimed at land, artifact and monument preservation and battlefield rehabilitation. 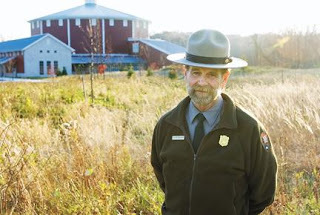 Latschar has served as superintendent of Gettysburg National Military Park since 1994 and is a 31-year veteran of the National Park Service. 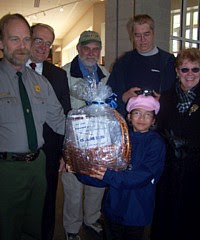 He was named superintendent of the year for the Northeast region of the National Park Service in 1991 and has been given other honors in more recent years. Wilburn took the foundation's reins in 2000 after stepping down from his position as president of the Colonial Williamsburg Foundation. 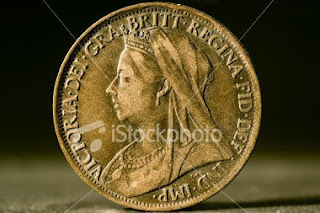 CWL: Go to the Evening Sun wwwsite and read the first six comments from the rancorous anti-Latschar, we-don't-like-change whiners. Yes, Latschar could be imperious at times but in his heart is the battlefield, its soldiers and its civilians. As an historian, tourist, and now related to a real estate owner, I applaud Latschar and what he has accomplished. Left: One of four Abraham Lincoln postage stamps unveiled yesterday in Springfield, Illinois. The celebration will be focused in the nation's capital, where museums, theaters and other attractions announced plans yesterday for more than 80 exhibits and programs in the coming months to celebrate the bicentennial of Abraham Lincoln's birth. The events will run from January through the end of April. "I haven't heard anything about a birthday cake," a Lincoln look-alike said, interrupting the announcement yesterday. Organizers assured the bearded impersonator he would get a slice of his favorite vanilla-almond cake - and a giant birthday card signed by thousands around the nation. Other programs are planned in all 50 states. The D.C. festival's highlights include a reenactment of Lincoln's second inaugural ball Jan. 31 in the building that now houses the Smithsonian American Art Museum and National Portrait Gallery. Ford's Theatre - where Lincoln was assassinated in 1865 - will also reopen after extensive renovation. The National Park Service will celebrate the 16th president's birthday on Feb. 12 at the Lincoln Memorial with singer Michael Feinstein offering a musical tribute. The memorial will be rededicated on Memorial Day - four score and seven years after its 1922 dedication, said Lance Hatten, the Park Service's chief interpreter for the National Mall. Text Source: Boston Globe, October 31, 2008. 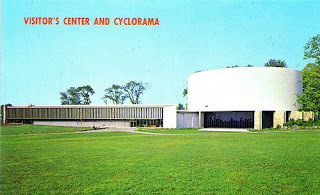 News---Will The Neutra Cyclorama Ever Be Razed at GNMP? 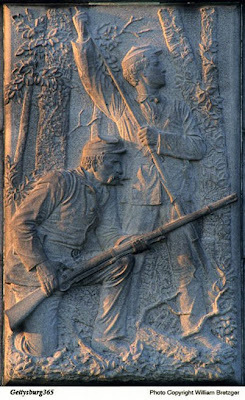 Park Service Holds Off On Cyclorama Demolition Pending Court Decision, Scot Andrew Pitzer, Gettysburg Times, Wednesday, November 5, 2008. A Virginia based agency, The Recent Past Preservation Network, and the son of the architect who designed the building — Dion Neutra — filed a suit to save the structure. 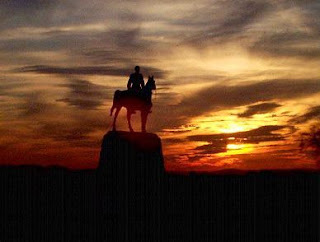 The park, meanwhile, intends to tear it down and restore that portion of the Gettysburg Battlefield to its 1863 appearance. In a court hearing last week in Washington, D.C., a federal judge ordered the park to notify the court whether it planned to proceed with plans to demolish the building. Park officials had announced that they wanted to solicit bids this month, and begin demolition shortly thereafter. U.S. District Court Judge Alan Kay said that a decision on the lawsuit probably won’t be made until December. Kay heard motions for a summary judgment, a legal term meaning that a judge rules on a case without it going to a full trial. He plans to file a recommendation with acting Judge Thomas F. Hogan, but doubted that paperwork would be filed until mid-December. 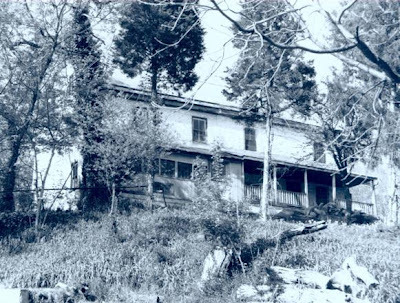 The old Cyclorama building is located atop Ziegler’s Grove with the former park visitor center, built atop land that was home to fierce fighting during the Battle of Gettysburg. Previously, the cylindrical building had housed a famous painting of Pickett’s Charge, but the artwork was moved to a new $103 million visitor center located about one mile away. Both the former visitor center and the old Cyclorama closed in April when the new visitor center opened. The Recent Past Preservation group believes that the building can be relocated to another property in Gettysburg, and that it could be used as a museum or theater. Preliminary conversations have been held between the group and Gettysburg area businessmen Eric Uberman and Bob Monahan Jr., about potential new sites for the building. “The Park Service never looked at an alternative to demolition in how to remove the building,” said Recent Past Preservation attorney Nicholas Yost. Government officials said that the building is outdated, that it has undergone 30 repairs since the 1960s, and that the goal is to recreate that area of the battlefield to its Civil War appearance. 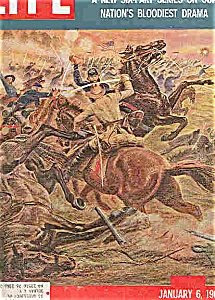 According to historians, 900 soldiers fought there during Pickett’s Charge, in what is dubbed The High Water Mark of the Confederacy. Also, the park has questioned the validity of the lawsuit, filed in December 2006. The six-year statute of limitations began in 1999, the park said, when it adopted its General Management Plan, and expired in 2005. Text Source: Gettysburg Times, November 5, 2008. 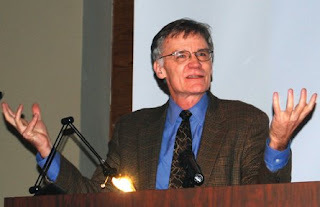 First Things , David W. Blight, History News Network, November 3, 2008. “First things are always interesting, and this is one of our first things,” declared Frederick Douglass on April 14, 1876, in Washington D. C., in the most extraordinary public address ever delivered by an African American to that date. Extraordinary for its argument and its audience. 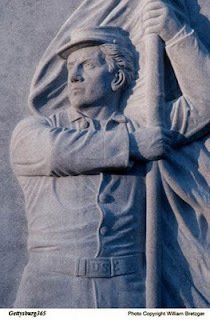 Douglass gave the dedication speech at the unveiling of the Freedman’s Memorial, the statue of a standing Abraham Lincoln, Emancipation Proclamation in hand, breaking the chains of a kneeling slave. Attending the event were President Ulysses S. Grant, members of Congress, the Supreme Court, and the president’s cabinet. No black orator had ever addressed such an official assembly. If elected President, Barack Obama will be the second African American to address such a powerful audience on inauguration day. Douglass struck chords of civil religion, referring to the “majestic dome of the Capitol,” and the sacred “heights of Arlington” cemetery. It was in this oration that Douglass famously called his white fellow citizens Lincoln’s “children,” but he and his fellow blacks “only his stepchildren.” One hundred and thirty-two years later we can still debate the meaning of those familial metaphors. As we contemplate the “first” of Barack Obama achieving the presidency of the United States, we should brace ourselves with a long view of our history. We should take deep breaths and imagine the long prelude of the thousands murdered for trying to vote during Reconstruction, the thousands lynched because of the poisonous fears of white supremacy. And we should remember the millions denied life chances during the prolonged night of Jim Crow. Only then can we help Senator Obama feel the weight of responsibility in becoming America’s ultimate “first thing.” Such remembrance is both burden and inspiration. If elected, Obama will have too many pressing issues to face to bask in mists of sentiment. But every American, whether they choose to or not, owns this heritage of slavery and racism that forces us to contemplate such first things. Whether they are the white “real Americans” in Sarah Palin’s small towns, or the rest of the equally real people in pluralistic and cosmopolitan cities, we all breathe in this past. The one a gray-haired gentleman, whose fathers had quit themselves like men, whose sons lay in nameless graves; who bowed to the evil of slavery because its abolition threatened untold ill to all; who stood at last, in the evening of life, a… ruined form, with hate in his eyes; -- and the other a form hovering dark and mother-like, her awful face black with the mists of centuries, had aforetime quailed at that white master’s command, had bent in love over the cradles of his sons and daughters, and closed in death the sunken eyes of his wife, -- aye,too, at his behest had laid herself low to his lust, and borne a tawny man-child to the world…. Obama’s two figures - the young white southern woman, born well after the sixties and who in her impoverished background should have become a Republican resenting blacks in the South, and the old black man who could not vote until after 1965 in South Carolina - reverse Du Bois’s earlier harrowing image of the old white man and old black woman. 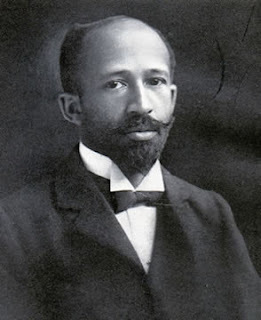 Obama shows us an alternative to the “children’s children” of Du Bois’s story. A new start? This election will test more than the changing metaphors of our racial condition. But “first things” are the stuff of real hope, and they can be grasped only through the long history that gives them meaning. This election will severely test how much Americans grasp the past they are being asked to overcome. If we are ever to build a society where no one must play the role of political “stepchild,” it will demand the informed courage of millions of Ashley Baias and her cousins of many hues. History is never over. Mr. Blight, teaches American history at Yale University and is author of A Slave No More; and Race and Reunion: The Civil War in American Memory. CWL: William Faulkner may have said it best. "The past is not dead. It is not even passed."